While out in Chamonix last week at the Freeride World Tour, Skipedia took the opportunity to interview Anders Ollgaard, Brand Manager Action Sports EMEA from The North Face. 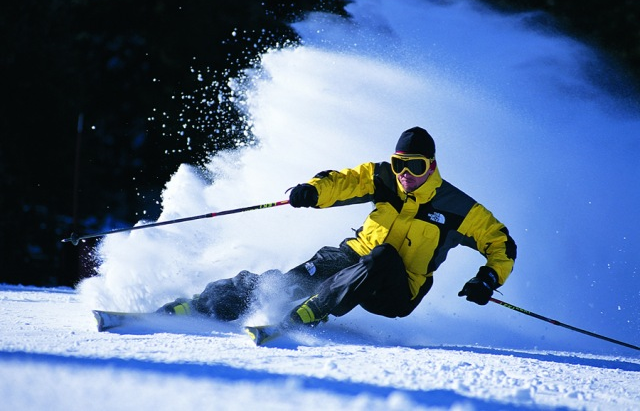 The company’s long term mission is “to become the global leader in snowsport apparel”. With that in mind, 98% of their winter collection has changed for 2013/14 and they have introduced a new premium line – the Steep Series – to accompany the existing Summit Series. How is the Steep Series different? “The Steep Series has the same technical qualities as the Summit Series, but will be targeting especially Big Mountain riding,” Ollgaard told us. How are The North Face planning to market the new range? We are focussing on four key stories as a platform for the launch of the Steep Series. Firstly, we are very excited about Mission Antarctic. This snowboarding trip has produced some amazing images and videos and you’ll see these shared as the year goes on. A second key element in our snowsport campaign is the follow up to groundbreaking ‘All I Can’ from Sherpas Cinema – ‘Into The Mind’. The critical and public reception for ‘All I Can’ was incredible, and we are expecting ‘Into The Mind’ to have a similar impact. Are mountain events a part of the plan? Thirdly, we are a key sponsor of the Freeride World Tour. This is our first year as the presenting sponsor, but we are committed to at least three years partnering this great event. We are all stoked to be part of this great event! We are also incredibly excited about the Olympics at Sochi 2014. We are the official sponsors of the US Freeskiing team and all the team will be competing in The North Face products. This is the first time North Face products. This is the first time Freeskiing will appear as an official event at the Olympics with the three disciplines; slopestyle, half-pipe and skier-cross. Uniforms are currently under development, but I can already now promise that they will have a very unique look and feel – and a special customization element across the colours. Anders Ollgaard finishes.